On May 9th and 10th, more than 5,000 of professionals gathered at the European Convention Center Luxembourg to discuss the latest digital, tech and space trends, and notably Space communications, the increasing use of Data, but also planetary defense and space mining, with experts from all over the world sharing their knowledge and vision. 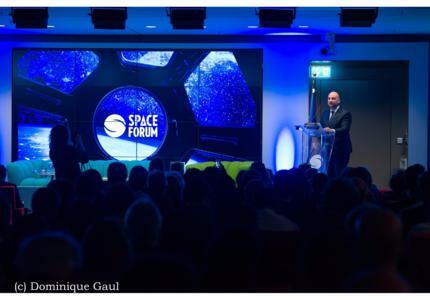 The second edition of the Space Forum was officially opened by Fabien Amoretti, Co-founder of ICT Spring, who expressed is deep gratitude to the Luxembourg government for its support and participation to the event, and called Luxembourg "the ICT place to be". Serving as Master of Ceremony of first morning of the Space Forum, Olivier Lemaire, Partner, EY, started his presentation by looking back at the history of the space industry, which moved from focusing only on communication and surveillance to a broader perspective: space mining, resourcing and so much more. "Technology has played a big role, changed and disrupted space communication. And Luxembourg recently showed its dynamism in the space area" added Olivier Lemaire. Yasrine Ibnyahya, Senior System Engineer, Inmarsat, then gave a presentation entitled "Enabling innovation in digital space communications" and highlighted the fact that now her company focuses on core technology and removes investments barriers by partnering with new players. She added: "We also put emphasis on insights, by making sure we actually value the data, and make it available to customers. Satellites are not about rocket science anymore, but are all about data science". Then, Patrick Biewer, CEO of LuxGovSat, a public joint-venture between the Luxembourg government and SES which was created in 2015, focused on the key drivers for governmental satellite communications. "The complex and non-predictable European and global security environments are very challenging for our industry" he started, highlighting that the value proposition it provides to governments is composed of security, accessibility, flexibility and entrepreneurship. "Space Communications: Broadband for the Other 3 Billion" was the name of the presentation of Steve Collar, CEO, O3b Networks, whose goal is to provide connectivity to people on the global basis. "In two and a half years, we have connected more than 35 countries" underlined Steve Collar. The CEO defines his mission as fixing the connectivity issues all over the world, and therefore making the world a better place, as it generates economic and social developments. These solutions are delivered via a constellation of satellites. Jacques Breton, Senior Vice President, Sales & Customers, Arianespace, then took the stage to focus on success enablers. "Currently, people think there is a lack of launch solutions, but there is actually lack of cheap and reliable launchers. Arianespace is one of the most reliable operators with 78 successes in a row" told Mr. Breton, highlighting the fact that many new players are coming, thanks to a lot of technology breakthroughs, such as the reduction of the mass of the satellites, a large variety of sizes and the possibility to reuse launchers. Olivier Lemaire also moderated a round table which brought together Sam Scimemi (Director for International Space Station (ISS), NASA Headquarters), Frédéric Touret (Alliance Manager, Luxtrust), Yasrine Ibnyahya and Jacques Breton showing the expansion of the space market with many different actors and players sitting at the table. "Many questions are asked, but not many answers are provided. There are a lot of requests for launch solutions and we need to be able to provide them whatever the demand" started Mr. Breton. According to Yasrine Ibnyahya, the industry benefits from lower costs and the entry of new players: "We are able to test more, we don't have to be as conservative as we were". Sam Scimemi insisted on the fact that we are now able to launch new initiatives around the Moon and Asteroids, and highlighted the importance of private-public partnerships. Finally, Frédéric Touret explained the benefits of quantum physics when it comes to security, and that the problem is limitations in distance: "And that is where space comes into the game. We need a relay in space". Aarti Holla, Secretary General, EMEA Satellite Operators Association (ESOA) then focused on the links between Satcoms and the 5G Ecosystem. "If you are in the ICT and Telco industries, 5G is the theme of the day. Governments all over the world are interested in it". According to her, the space sector is innovating more than ever, and private investment is a good way to start the 5G discussion: reach & inclusion, resilience, quality & cost are the main requirements, through a collaborative approach. The morning session ended with Dr. Amin Salari, Chairman of Board at Iran Aviation and Space Industries Association, presenting the technology capabilities of Iranian Space SMEs. The association creates an appropriate structure to cooperate as consortium and develops relevant international relationships. The afternoon session started with a presentation by Dr. Nicolaus Hanowski, Head, Ground Segment & Mission, ESA, who notably presented EU initiative Copernicus. "We live in an unprecedented era, with satellites being launched every 3 or 4 months. We have also seen an overall investement of 6 to 7 million over the last 10 years" he added. According to him, one of the biggest challenges is data management: we need to provide data continuity, share them, make sure they are reliable, work on near real-time data, etc. "Adding more satellites to the system contributes therefore to the data ecosystem" he concluded. In order to making sense of the world through the lens of location, Peter Kürpick, Executive Vice President & Chief Platform Officer, HERE, took the stage. "30 years ago we were using paper maps, today, every car has a navigation system, and so do mobile phones" he started. Peter then highlighted the need – and huge demand – for precision data, as 10 billion people will be living in 200 megacities in the upcoming years. "Satellite imagery therefore plays a crucial role to bring this precision data to consumers" told the Chief Platform Officer. To address the challenges of integrated the Internet of Things with satelites, the organizers welcomed Dr. Maria Rita Palattella, Senior R&T Associate in the Environmental Research and Innovation (ERIN) department, LIST. She first insisted on the fact that now we cannot live without connected devices: "The number of IoT connected devices will surpass mobile devices in 2018 and the business opportunities brought by IoT are therefore immense". Satellites also have the potential to help IoT grow by increasing coverage, reliability, speed, and lowering cost. "Satellites are cost-effective solutions for IoT connectivity needs". She then presented the M2MSAT project to the audience. "I grew up during the Apollo days, and thought we would already be on the Moon by now" started Gary L. Martin, Director of Partnerships at NASA Ames. In his presentation, he focused on the importance of partnerships for the NASA: "It allows to access capabilities under collaborative agreements, it expands our overall landscape of space activity, and it spurs innovation". The NASA partners with all kinds of organizations, as more people means more feedback, and also more innovation. Gary L. Martin then presented the core competencies and activities at Ames. The NASA Ames Director of Partnerships then joined Dr. Nicolaus Hanowski and Peter Kürpick for a round table discussion moderated by Alexey Belyakov, Managing Director at Skolkovo Aerospace. The space experts exchanged on the importance of data and collaboration – and consolidation – between companies: space, startups, and ICT. After a well-deserved break, Christophe Fourtet, CTO & co-founder of Sigfox gave a presentation entitled: "Is satellite a relevant complement for terrestrial massive IoT?". He went through the IoT satellite connectivity market, listed the different advantages of using satellites when it comes to the Internet of Things: tracking moving assets, securing better, improving uptime, optimizing resources and managing people remotely. "From Asteroids to Aliens: How AI Makes Sense of Big Data" was the name of Jaap Zuiderveld's presentation. The VP EMEAI of NVIDIA, started by saying that space programs need to process massive amounts of data, and insisted on the importance of graphics processing units, or GPU. He then explained how effective AI and Deep learning have proved to be for researchers, scientists and organizations investigating the mysteries of the universe. "Three teams of researchers using GPU-powered deep learning spent the summer tackling asteroid-related challenges at NASA’s Frontier Development Lab, in partnership with the SETI Institute, a nonprofit organization devoted to researching life in the universe" he concluded. The organizers then welcomed Dr. Ali Sadeghi, Director General of remote sensing department, Iranian Space Agency, who shared his perspective on space cooperation opportunities in Iran. The missions of the agencies are notably to cooperate in the execution of regional, and international space projects but also planning for strengthening national, regional and international communication networks. Two companies then participated in the Startups insights session. Sylvain Arts, Sales & Marketers at Earthlab focused on "Spatial Big Data & Deep Learning Factory" sharing his Luxembourg approach for empowering strategic decisions. Masayuki Sono and Ostap Rudakevych from Clouds AO gave a presentation entitled "Connecting Horizons: Towards a New Typology in Space Architecture" and presented some of their design projects for settlement in space. The first day of the Space Forum ended with a presentation by François Rivasseau, who's the Head of Security Policy Division, EEAS for the European External Action Service’s Special Envoy for Space. He insisted on the fact that a unique space strategy is needed in order for Europe to continue its space development and innovation. "We need to expand the space world and create an actual space community" added Mr. Rivasseau. He also listed some of the challenges faced by the space industry: making the private sector more active in Europe, and also the must-needed legal framework. "2017 will be an important year for space exploration" he concluded. Experts met again on May 10th to attend the second day of Space Forum. The morning session was moderated by Clive Cookson, Science Editor, Financial Times. "Asteroïds represent both an incoming threat but also many positive opportunities offered through space mining. And Luxembourg has a key role to play in it" he added, underlining the fact that Goldman Sachs recently published a report giving space mining even more credibility. Simonetta di Pippo, Astrophysicist and Director, UNOOSA, presented the role of the United Nations, and told the audience about global governance in the safety, security & sustainability of outer space activities. "Working groups and expert groups, constantly monitor the advances in space technology and the rapidly evolving space agenda with a view to developing new mechanisms reflective of the new complexities of space activities" added Mrs di Pippo. Their efforts include addressing the broader concept of space security, transparency and confidence-building measures in outer space and working towards securing the long-term sustainability of outer space activities. She concluded: "Building resilient societies through better coordination and the forging of global partnerships is one of the key challenges in the twenty-first century". CNRS Research Director Dr. Patrick Michel then listed the necessary steps and current activities when it comes to planetary defense. "Most asteroids can be found in the belt located between Mars and Jupiter. The Moon is the best witness of the asteroid impact history of the inner Solar System" he stated. According to the experts, an inventory is necessary. Asteroids then need to be characterized so that we can understand their properties to test the best techniques to deflect them. "We need to understand their behavior" he concluded. Dr. Michel also participated in a Q&A Session moderated by Chris Welch, Professor, International Space University, along with Grigorij Richters, Co-Founder of Asteroid Day and Moses Milazzo, Research Physical Scientist, Astrogeology Science Center. "Cooperation is key. We need to educate people and highlight what scientist are doing. We are doing something good for our planet. There's actually a lot a geopolitical work to be done" started Grig Richters. According to Dr. Michel and Mr. Milazzo, multiple approaches of deflection need to be tested and have disaster relief plans, because "we are not ready for it". Kyle Acierno is Managing Director of ispace Europe, which is currently working on Luxembourg’s first lunar resource prospecting mission, pushing the boundaries of lunar frontier. ispace participated in the Google Lunar XPrize competition and will go to the Mare Imbrium area of the Moon on December 27th, 2017. The company signed a MOU with the Luxembourg government in collaboration with the LIST, which specializes in mass spectrometry. "It won't be an easy mission and we needed the smartest minds to support. The best place to do it is Luxembourg" he concluded. The compelling opportunity of asteroids was then presented by Chris Lewicki, President & CEO, Planetary Resources. "With offices in Luxembourg and a growing team, 2017 will definitely be an exciting year for space mining. And it's not just about space exploration, but also about scientific enquiry. Space is actually a new way to do business, it creates a new economy composed of cities, transportation, energy and finance" explained M. Lewicki. According to him, with the announcement of spaceresources.lu, the country of Luxembourg put itself on the global space map. He then joined Jean-Jacques Dordain, Advisor of spaceresources.lu, for a Q&A Session moderated by Clive Cookson. The former ESA Director explained that many space companies are now settling in Luxembourg and that the spaceresources.lu initiative is running and moving quick: "We made fantastic progress and the wall between Earth and Space is falling". Chris Lewicki also settled in Luxembourg for its R&D mentality and its ability to solve the key challenges to extract water from an asteroid and scale it. "Space resources are a benefit for Humanity" concluded Jean-Jacques Dordain. "How do we safely approach and sample a spinning asteroid?" was the question asked by Moses Milazzo, Research Physical Scientist, Astrogeology Science Center. "We need to understand our Solar System even more. Osiris-Rex will collect samples on Bennu, one of the most extensively characterized asteroids". Its arrival is planned for August 2018, and will be back on Earth in September 2021. This mission will allow us to understand the rotation rate, temperatures, surface structure and natural satellites and debris fields of Bennu. Jim Keravala, Chief Executive Officer of Offworld focused on the Solar System Industrial Robotic Workforce and shared his vision: "We are developing a robotic workforce for heavy industrial jobs on Earth, Moon, asteroids & Mars. This could turn the inner Solar System into a better, gentler, greener place for life and civilization". This second morning session ended with the speech of Etienne Schneider, Minister of the Economy and Deputy Prime Minister of the Government of Luxembourg. "We are determined to extend frontiers. Spaceresources.lu is the next step in the government's efforts to diversity and expend into the space sector" started Mr. Schneider, who wishes to consolidate the existing know-how and build new competencies in the space domain. A new legal framework for space resources will soon be discussed in parliament, and the government will launch a Cybersecurity competence center next October, making the country a dedicated spot and leading place to cybersecurity. A "New space industry conference" will also be organized in Luxembourg on November 12th, bringing together startups, space actors and tech innovators, making the country the heart for collaboration and innovation. The Minister also announced the launch of a Luxembourg Space Prize in collaboration with ESA, and the development of Space Agency and Space fund in the Grand-Duchy to help startups active in space mining and based on commercial activities. Joe Landon, Chairman & Managing Partner, Space Angels Network, acted as master of ceremony for the second and last afternoon of the Space Forum 2017. He first introduced Sam Scimemi, Director for International Space Station (ISS), NASA Headquarters, who focused on the ISS and the LEO economy. "There has been an increasing change in the constructs for human spaceflight and low Earth orbit, moving towards inclusion of broader economic influence on LEO and spaceflight activities, and a willingness to continue shaping and driving the launch industry worldwide" he explained. He then shared NASA's vision for LEO: "Sustained economic activity in LEO enabled by human spaceflight, driven by private and public investments creating value and benefitting Earth through private industry supply and private and public demand". "Integrated space applications for disaster management" was the name of the presentation given by Lucien Hoffmann, Director of the Environmental Research and Innovation (ERIN) department, LIST. He focused on the different types of environmental disasters, with huge economy impact, and on how to manage these disasters. Lucien Hoffmann therefore insisted on Earth observation, navigation, secure telecommunications, remote sensing, but also preparation, response and mitigation: "It needs to be seen as a whole lifecycle. Drones and social data also need to be exploited and give additional information, which was unthinkable a decade ago". Chris Welch, Professor, International Space University, focused on new space opportunities and shared the views of ISU, which is located in Strasbourg, France. ISU is a not-for-profit institution dedicated to the development of space for peaceful purposes. Its programs are based around Space Engineering, Space Sciences, Human Performance in Space, Space Applications, Space Management and Business, Space Policy Economics and Law, Space Humanities and 3Is Space. "3Is means international, interdisciplinary and intercultural" explained Chris Welch who then presented several ISU team projects. The organizers then welcomed Bertrand Baratte, Space Business Unit Director, Air Liquide, who shared the company's ambitions in the new space industry, notably to tackle and fight global warming and climate change. "Space is a formidable tool to prevent this threat and allows us to observe and control. Space pushes the limits of technology innovation, which has become essential for Humanity" added Mr. Baratte who concluded: "Every development in Space will be useful for ground technologies". A round table which brought together Sam Scimemi, Lucien Hoffmann and Valery Komissarov (Portfolio manager, Skolkovo Foundation) was then moderated by Joe Landon. "The role of the government is to take the risk and push the boundaries of technology, as many companies cannot afford to take risks" started Mr. Scimemi. Valery Komissarov is particularly interested in the fact that AI and earth observation are getting together but also by the rise of the drones and the constellation of high resolution data. Pete Worden, Chairman, Breakthrough Prize Foundation and former Director of NASA Ames Research Center then gave an inspiring presentation on the exploration of the nearby star systems. He presented the projects supported by the Breakthrough Initiatives: "Technology is coming along to the point we can seriously think about sending something to the nearest star to find evidence of civilization. We are now able to make things much smaller and can build a powerful laser light to actually send a starship to the nearest star". Pete Worden then explained what Breakthrough Starshot was all about, with Stephen Hawking & Yuri Milner announcing a 100 Million USD commitment over a few years in April 2016. JAXA’s Open Innovation creating Dual Use Technology to both Ground and Space was the topic of Hitoshi Kuninaka's presentation. The Program manager at Jaxa then shared the closest snapshot of asteroid Itokawa captured by Hayabusa. He then got into details concerning the Hayabusa2 project which is set to return to Earth in 2020. "It is an exciting moment to be part of the space industry" started George Whitesides, CEO, Virgin Galactic, who shared his – and Richard Branson's – vision of the future of space flight. "Only 556 people have actually been to space, and we already have more than 600 demands to use the world's first spaceline" he added. Virgin Galatic is also working on LauncherOne, a revolutionizing access to space for smaller satellites. Roberto Provera, Director of New Initiatives and Customer Solutions Development in the Domain Exploration and Science, Thales Alenia Space, then focused on the next steps in space exploration. "Our goal is to make exploration affordable. We also invest in robotics exploration" he explained before concluding: "Deep Space Exploration is the new challenge. An adequate on orbit demonstration as well as technology enhancements need to be carefully planned. Also, exploration sustainability is a key factor in the equation. Hence all public and private stakeholders must cooperate to develop best practices and strategies". Daniela Dobreva-Nielsen, Business Development, AZO – Space of Innovation, then took the stage to present the initiatives launched by AZO, such as the development of the biggest space network of innovation but also the creation of several space innovation competitions. "In Europe, there are many big players, initiatives, startups, but no real ecosystem. Our vision is to create such an ecosystem" she added. Finally, the event ended with Jason Aspiotis presenting his startup SpaceVault, which is a digital banking platform in support of the Space industry and which can be seen as a "credit-union" or "co-operative bank" for Space. It is launching in the US in the summer on 2017. Space Forum will take place during ICT Spring 2017 which will gather more than 5000 ICT Professionals through various topics such as Fintech, Digital, Tech and Space. Space Forum is a conference based on the impact of space technologies on the earth’s businesses (mobility, IoT, connectivity, security, climate, media, earth observation…). It gathers European Space Clusters & Tech Valley representatives, Space business angels, satellites operators, satellite industry suppliers etc. The 2017 edition of Space Forum organized by Farvest Group, the leading marketing & events agency in Luxembourg.